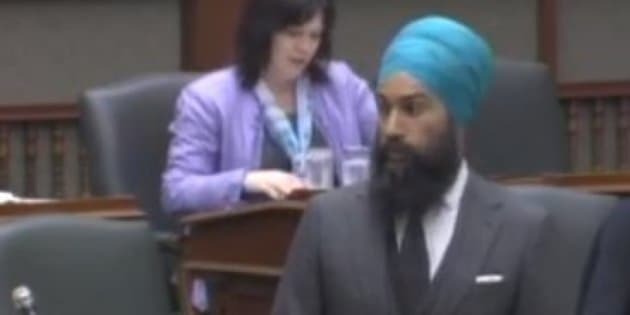 Jagmeet Singh is a member of provincial parliament, deputy leader of the Ontario NDP and a member of Toronto&apos;s Sikh community. It&apos;s that last detail that he says is the reason he&apos;s been stopped by the Toronto police at least 10 times. "I&apos;m sure looking diverse or standing out was certainly a part of why I was targeted," Singh said in an interview on CBC&apos;s As It Happens. "Much like the report that we&apos;ve heard from the Law Union [of Ontario], people that are black and brown or racialized people are stopped far more often than other folks." Singh is calling for a provincial strategy against carding, a practice whereby a police office can stop, question and collect information on a person without making an arrest. That information is then stored indefinitely in a secret database. Singh is proposing legislation to prevent police across the province from detaining and stopping people arbitrarily. "The buck stops with the ministry of the Attorney General," he said on CBC&apos;s Metro Morning. "The ministry is in an excellent position to provide leadership." He remembers waiting for a friend in the Casa Loma area when he was surrounded by police. He was stopped and asked for his identification. As a young lawyer, he decided to exercise his rights and refuse to show identification. "The police officer got really aggressive," he remembered. He walked away but was followed by police officers to his car. The police then pulled him over when he was in his car, since they then had the right to ask for his identification under the Highway Traffic Act. "At the minimum, the province can provide leadership and very clearly state this is a practice that violates the charter — it is the epitome of arbitrary detention and a little bit of unreasonable search and seizure thrown in," he said. Mark Saunders, the Toronto police chief who has promised to examine carding but has gone on record in support of the tactic, weighed in on Singh&apos;s proposal to end carding. "I don&apos;t like to get into politics — he is chosen by his constituents for a reason he obviously represents them well. "I&apos;m glad for that," said Saunders. "I hope he has an opportunity to read our procedure and our policy and read where we are covered with what statutes allow us to behave the way we do, it is lawful and it has been proven lawful. So if he wants to read everything and come back for an informed decision then I am all for it."